Our Magic Bands Have Arrived!!! The Magic Bands have arrived!!!!!! !…and our Magic Your Way Package Booklet came last week….so we are all set and ready to go on our December Disney World Trip!!! We purchased the Magic Your Way Package through Disney. Combining our Room at the Pop Century Resort with our Park Hopper Tickets. We also chose the Deluxe Dining Plan and added the Memory Maker Package as well. 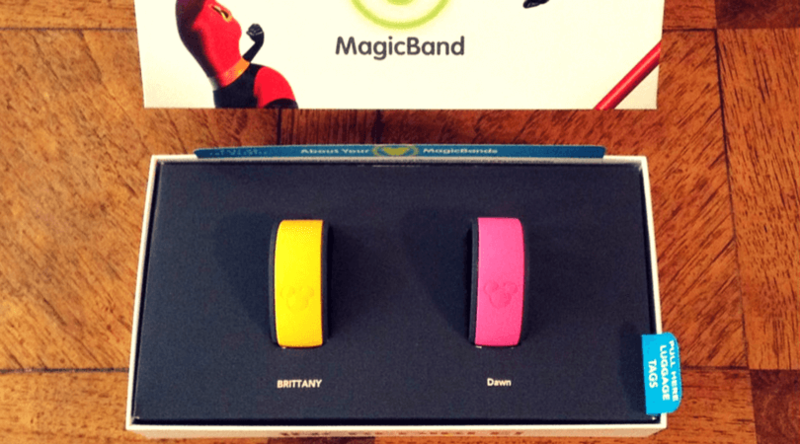 When staying on Disney Property the Magic Bands are complimentary and come in 7 colors to choose from….just another Benefit of Staying on Disney World Property! Our Magic Bands Have Arrive! !….So What’s in the Box?! Our awesome little “Incredible” Box came with (2) Magic Bands which allow access to our room, park entry, dining credits, and making purchases. Included with our Magic Bands were these adorable luggage tags that are designed to match the color of your Magic Band. These Magic Bands make everything about your trip more convenient, and I highly recommend them…even if you aren’t staying at a Disney Resort! This booklet contains information on everything that is included in your Magic Your Way Package. Also included inside are vouchers for free entry into the ESPN Wide World of Sports, and admission to either Disney’s Fantasia Gardens or Winter Summerland Miniature Golf. At the back of the booklet is a Magical Extras Savings Card. This card gives awesome discounts at select locations throughout the Disney World Resort. I truly appreciate how Disney goes out of their way to add extra special magical touches to our vacation. Getting these items in the mail before our vacation is definitely magical and exciting!! Subscribe Today for Weekly Disney Tips! !